Here is my first parlor guitar. What a gas to build and play. These have a 24.5" scale length and both have a 1 11/16" nut. They are 12 frets to the body. I have designed a whole new bridge that is in keeping with the baroque era instruments I patterned it after. It is 12 1/2 at the lower bout and has an 18 1/2 inch long body. The bridge has our innovative 10 degree back slant for various, no briainer reasons (see our "Features" page on our our website). The intonation is perfect and is a blast to play because of the short scale. 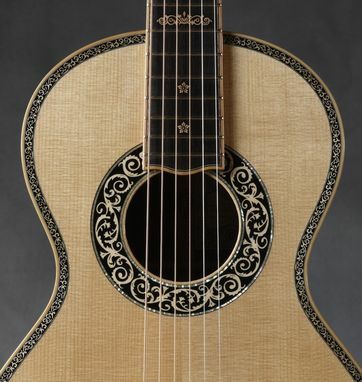 Little body, short scale, short neck, lightly braced, graduated top, state of the art bridge (in a baroque style!) and it sounds amazing. 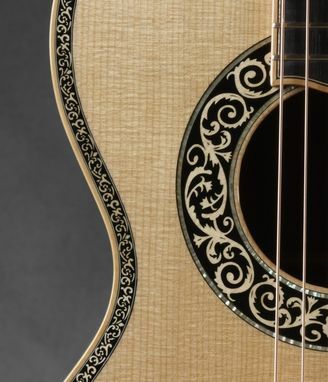 We are featuring a new 1/4 inch Purflex® purfling pattern as well as a new beautiful baroque style rosette and new baroque truss rod cover. 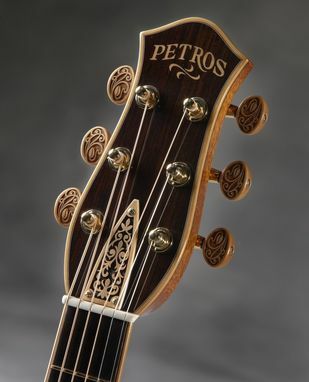 The "Baroque" model is made of East Indian Rosewood and a special, old, wide grain Sitka Spruce top. All the appointments are Boxwood. Dimensions: 12 5/8" by 18 1/4" body. 24 1/2" scale length. 1 11/16" nut width.